The UI Greenhouse sits on top of Biology Building East, giving students a place to develop research, observe plants, and express their passions for plant life. Sitting at the top of Biology Building East, the University of Iowa Greenhouse has provided students and community members a space to study and follow their interest in plants. Ray Tallent, who has been the Greenhouse manager for approximately 10 years, along with assistant and UI senior Majd Moubarak, tend to the plants in the Greenhouse and maintain the space’s temperature. There also are a substantial number of volunteers who help around the facility with watering and pest treatment. “We grow the plants for education, of course, but generally, we are able to offer field trips and different experiences in the Greenhouse,” Tallent said. There are currently seven rooms, some of which have themes with the plants. Four rooms hold both student and volunteer plants, and the remaining three are for teaching and public enjoyment. The Greenhouse has more than 200 plants and can be toured throughout the year. The Greenhouse supports the research of many UI students on a plant biology track or interested in learning more. Moubarak uses the Greenhouse for her research and uses the hands-on experience she has received through working for the Greenhouse. “I get to water the plants all day long and observe the changes in their growth,” Moubarak said. Many of the plants have come from various countries over the years, some having spent more than 50 years with the university. Although the Greenhouse location has changed many times, the plants have wound up in the central location atop Biology Building East. Seed exchanges, purchases, and other avenues through sellers and other institutions have been used to obtain plants, Tallent said. The enjoyment, the aesthetics, and more all filter in the overall mission of the Greenhouse. It serves to educate, provide public enjoyment, and give a method of research for the students at the UI. The Greenhouse holds many favorites for both Tallent and Moubarak. However, there are many plants relating to food — coffee beans, lemons, avocados, bananas — that have a special place in Moubarak’s heart. “We have been known to sample,” she said. The Greenhouse allows students to take plants they desire with permission from staff. Many students use the Greenhouse for their research or personal enjoyment. The UI Gardeners clubhouses many plants in the Greenhouse. “I don’t do this for them,” Tallent said. “This is their own gig. They grow hydroponic plants, with no soil involved.” A very prominent plant the UI Gardeners club uses in the Greenhouse is kale. 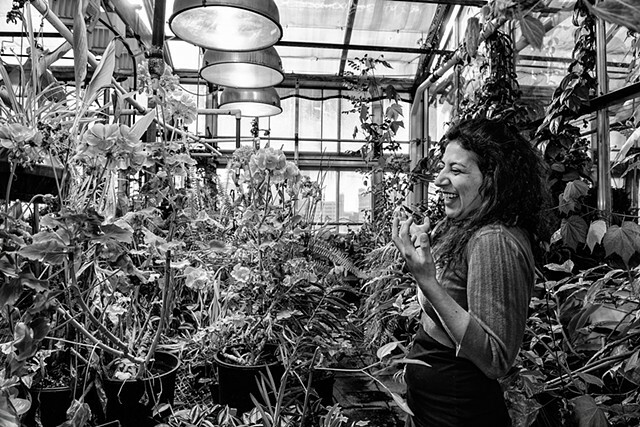 A graduate student teaching Elements of Art for non-majors, Alexis Beucler, uses the Greenhouse every week to inspire her students in their work. “I take my students to the Greenhouse numerous times a week to inspire them,” Beucler said. “It’s an investigation — these ‘organic’ places are more interesting to discover shape, color, and texture for their art. 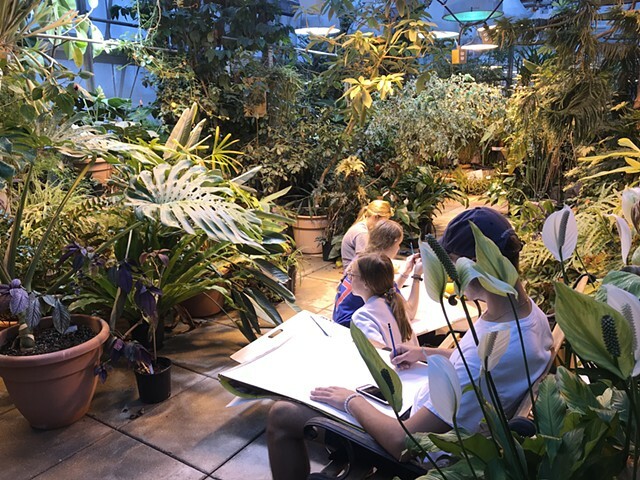 I hope that through the Greenhouse they develop a greater appreciation for natural spaces.” Beucler has her students use the Greenhouse in partnership with natural museums to develop art based on what they see. She will display her students’ artwork from the Greenhouse in Art Building West this upcoming week. “Not many people know we’re up here, but we definitely are open to visitors and new faces,” Tallent said. November 5 - 10th, 2018. 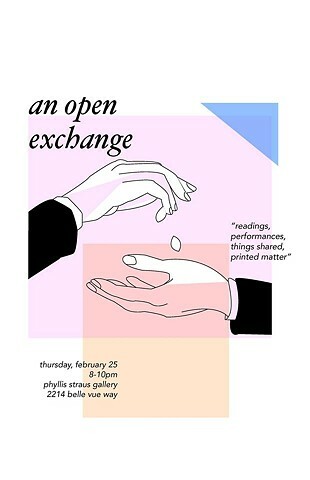 Exhibiting gouache paintings and lithographs. 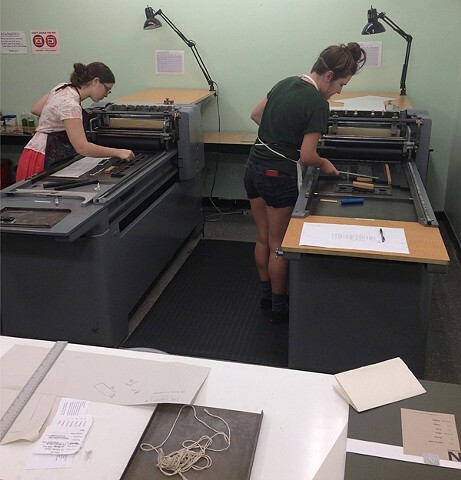 This semester, Fall 2018, I have been taking my Elements of Art students to the University of Iowa's greenhouse in the Biology Building East. It's been a great experience discovering different plants, watching them transform, and watching my students get excited about nature. 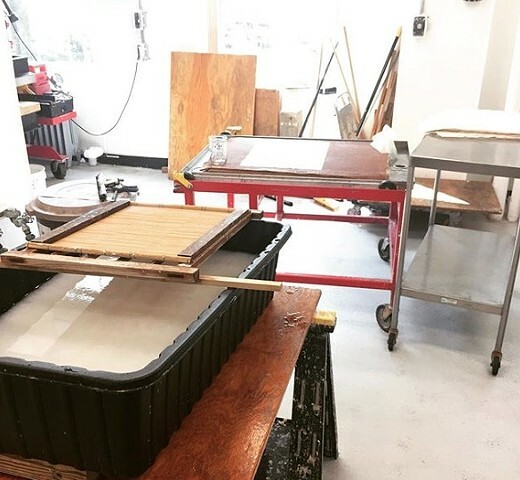 Fall 2018: Learning the art of stone lithography with Tom Christison! 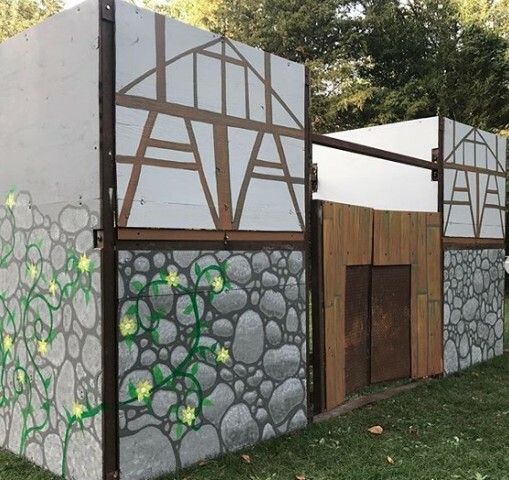 Fall 2018: I taught a mural painting workshop as a community engagement project in a medieval organization I’m a part of last weekend-- it was a ton of fun. Thank you to everyone involved! 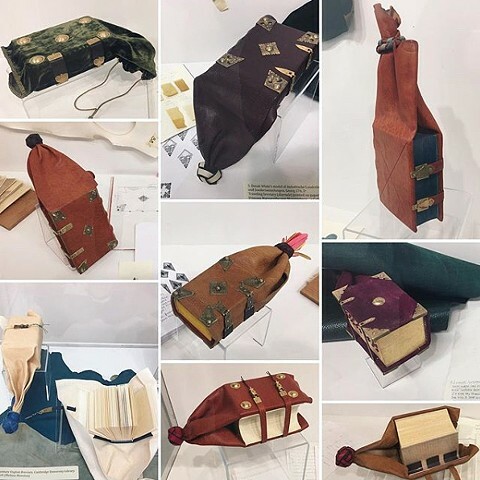 The exhibition for this past semester's advanced bookbinding course "From the Hip: Making Models of Medieval Girdle Books" is up in the UICB K. K. Merker Gallery for the next few weeks. Be sure to check out the fantastic work that this class put forth in their efforts to learn and recreate these unique book structures! 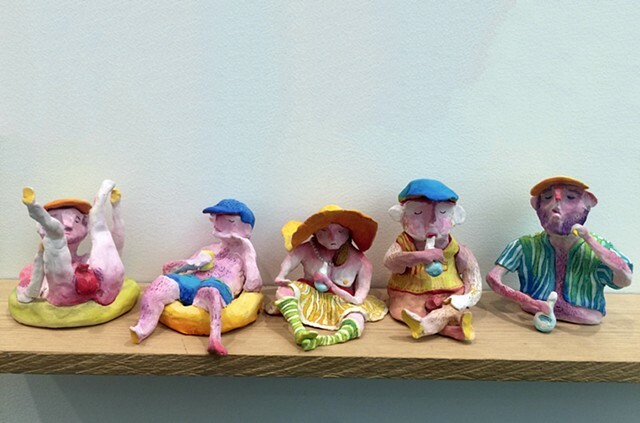 Spring 2018: Exploring the art of ceramics in Andy Casto's graduate ceramics workshop! These little figures appear as models in a few new oil paintings. 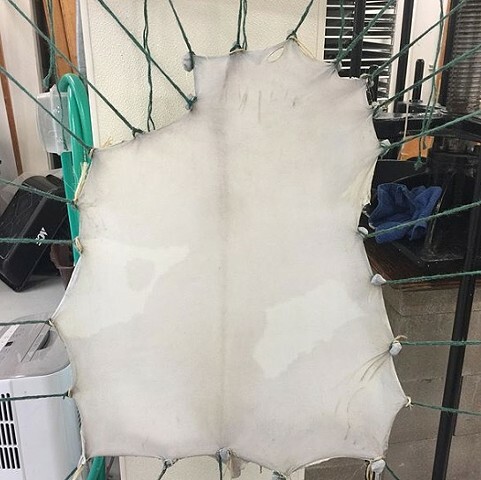 Fall 2017: Learning how to make paper! Nepalese, Indo-Islamic, and Japanese with Rhada Pandey. August 2017: Moving into my new studio space at UIowa! Huzzah! 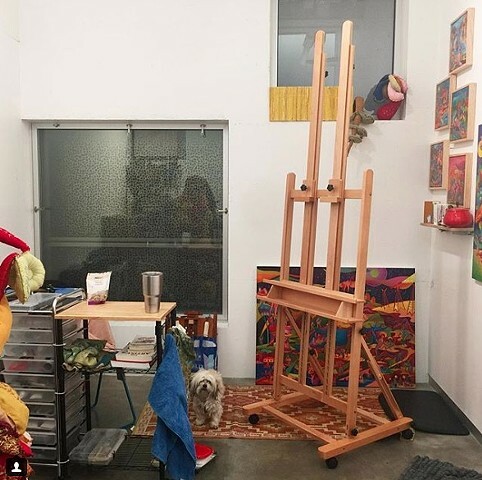 A new state, home, studio, easel, school! I'm ready to have a great next 3 years and am looking forward to seeing how much my artwork changes. 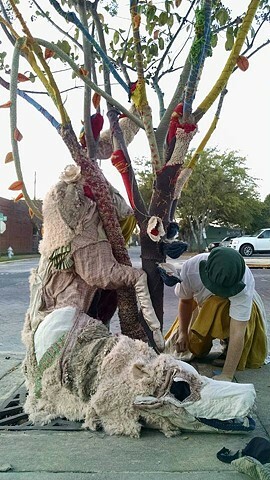 Furry & Feathered is a yarn bomb art in the open competition & exhibition in Thomasville, GA. On the main street, artists in groups of 1-3 each cover one of the 21 trees! Maria Ojeda, Madalyn Tucker, and I each have a tree and are covering it up! Here's a work-in-progress shot of me working on the installation! 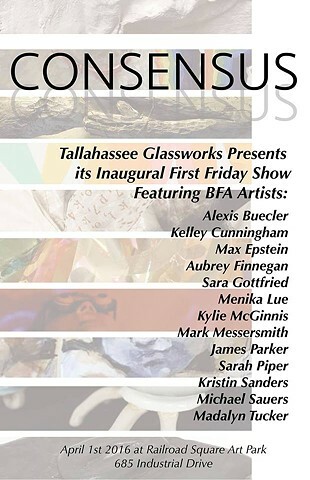 Group show at the Tallahassee Glassworks Gallery in October. 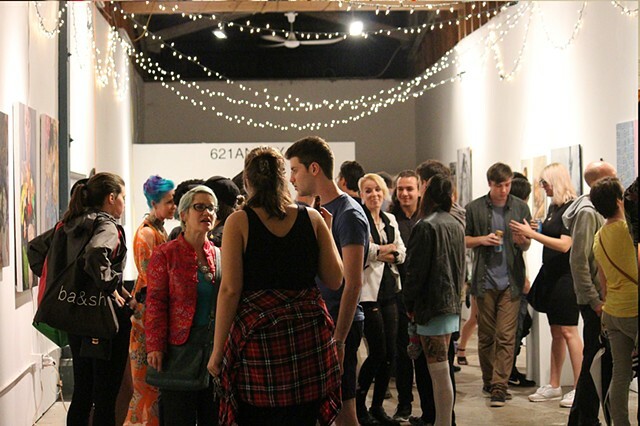 Opening reception: October 7th, 2016. Contemporary artwork ranging from abstract painting, sculpture, video collage, ceramics, drawing, and narrative painting all join in unanimity. Creating in discrete disciplines but within an alike environment, these works reverberate an aura of the here and now. 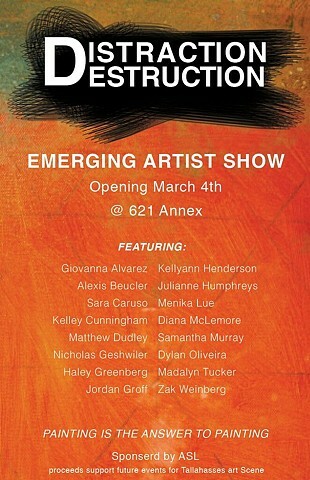 Works from FSU BFA artists Alexis Beucler, Kelley Cunningham, Max Epstein, Aubrey Finnegan, Sara Gottfried, Menika Lue, Kylie McGinnis, James Parker, Sarah Piper, Kristin Sanders, Michael Sauers, Madalyn Tucker and regional artist & FSU professor, Mark Messersmith, will be on display from 1 April - 4 April 2016. 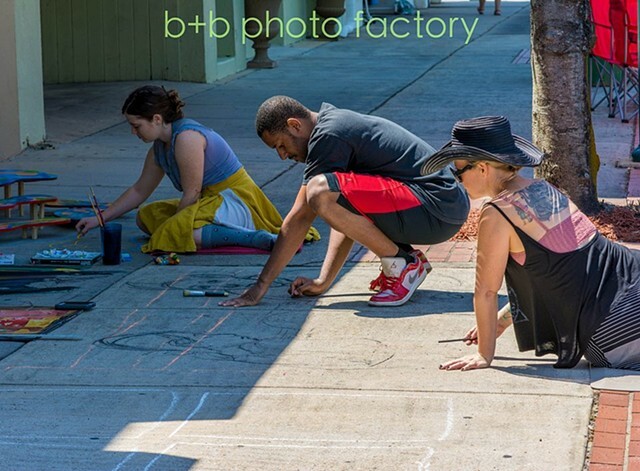 Please join us this First Friday at Railroad Square to stomp across Max's new space and enjoy some art! 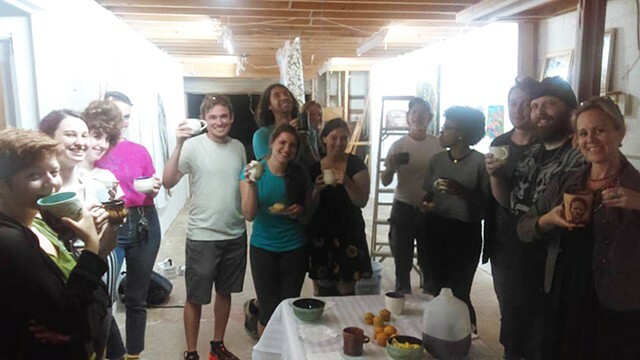 Getting ready for the first show in Max Epstein's gallery space and glass workshop, Tallahassee Glassworks, BIG MIKE performed a tea ceremony in celebration. 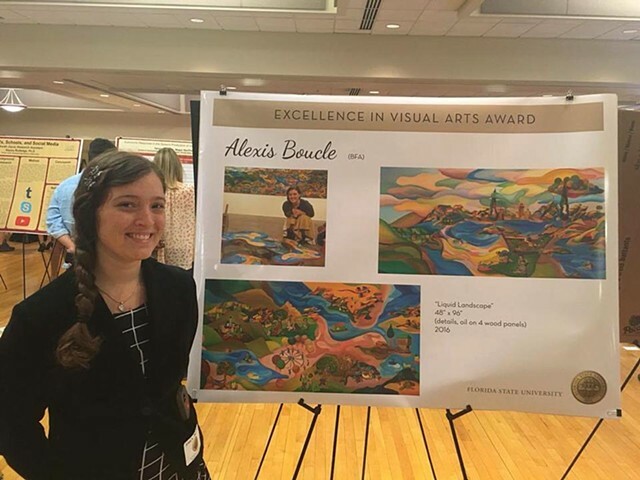 I received FSU's Excellence in Visual Arts award. From May 2015 - May 2016, my Liquid Landscape (panels I- IV) paintings will be on display in the Honors, Scholars, and Fellows House smile emoticon it's above the new Chick-fil-a on the FSU main campus. And no, I did not change my name to "Alexis Boucle." It's still "Alexis Beucler"
"Painting is the answer to painting"
Meet Maria Ojeda! Working with fiber arts and drawing collage, Maria is one of the three artists in the "Marked Lands" collaborative show. Statement: "Like water, the formation of civilization brings with out all it passes over. Collectives pick up and deposit geological and cultural sediment, moving assiduously through suggested routes, which by use, become carven paths. Connections haphazardly break the silence of cyclical nature. Power lines, utilities, and all other necessary implants designed for survival quickly disappear in the noise of repetitious life. Humanity accumulates in piles & sprawls, contracting, overflowing, and expanding. An infusion of fences, telephone poles, and paths upon path upon paths... Cliffs break under weight of organization. Crowned peeks are flattened, replaced with towers of human imagination, beaming comfort across appropriated lands. Meet Laura O'Connor! Working with drawing collage and ceramics, Laura is one of the three artists in the "Marked Lands" collaboration show. 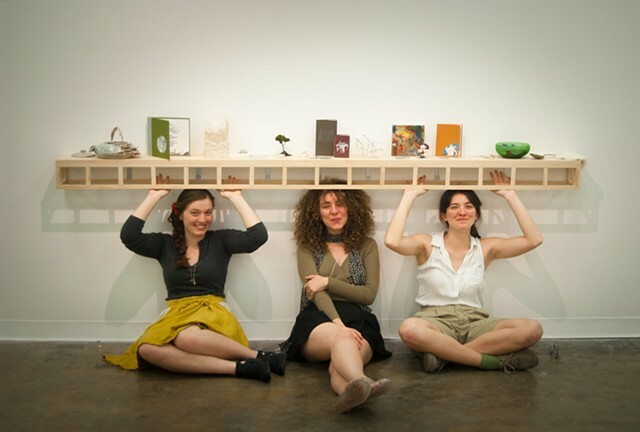 Statement: "I seek to understand my yearning for connection and search for belonging through the objects I craft. Over years of transience, I have met many people and acquired different languages: yet despite shared experiences, I continue to untangle a deep lonesomeness. Through cathartic repetitive processes such as ceramic coil rolling and geometric structure building, I create landscapes from shared stories using images of networks. I strive to honor the beauty and interaction between raw materials, allowing space for each to be seen as it truly is." 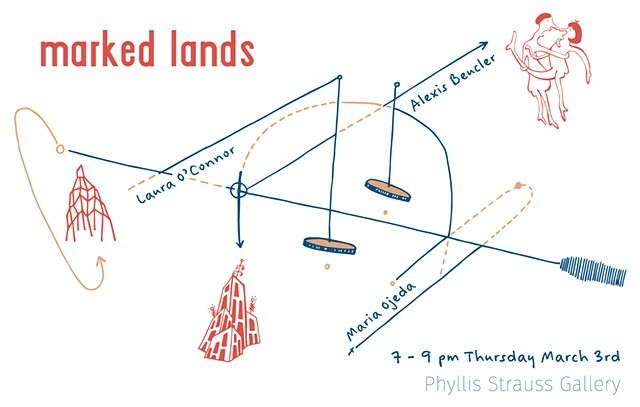 "Marked Lands" is a collaborative exhibition between three artists, Alexis Beucler, Laura O'Connor, and Maria Ojeda. Painting, cardboard and clay, fiber and paper, all come together in an exploration of infrastructures of self and civilization. Light refreshments & a limited edition of catalogues will be available! An evening of multitudes. We are of participating and performing, of listening and speaking, of seeking and interacting. An edition of posters available on a first come, first serve basis. Performances will begin at 8:30. This event is happening alongside Working Method Contemporary's "Image Abreaction"
"Wait, Wait, Don't Tell Me" is an invited collaborative art show in the Phillis Straus Gallery: "A disparate collection of works that are currently still in progress, set aside for a while, or abandoned completely. Also kind of like the NPR show, but not as clever." I exhibited the Ladies on a Mountain WIP painting. "Honerable Mention" Award for "Liquid Landscape"
"Liquid Landscape" received an "Honorable Mention" award at the Valdosta National 2016 group exhibition! Where: Dedo-Maranville Fine Arts Gallery, VSU Fine Arts Building, corner of Oak and Brookwood. When: The exhibit runs from 6-7:30 p.m. Tuesday. 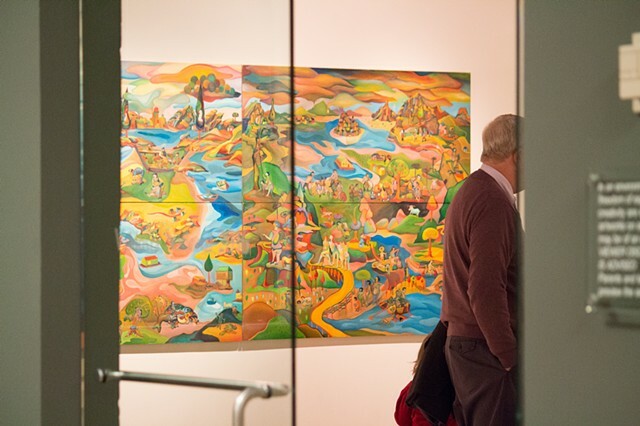 Reception: A free, public opening reception is scheduled for 6-7:30 p.m. Tuesday. Gallery hours: 8:30 a.m.-5:30 p.m. Mondays through Thursdays; 9 a.m.-3 p.m. Fridays. More information: Contact Julie Bowland, gallery director, (229) 333.5835, or email Julie Bowland. Valdosta National 2016 annual exhibition! I was accepted into the Valdosta National 2016 annual exhibition! "VALDOSTA — The Valdosta National art exhibit has become one of the best annual art shows in Valdosta. 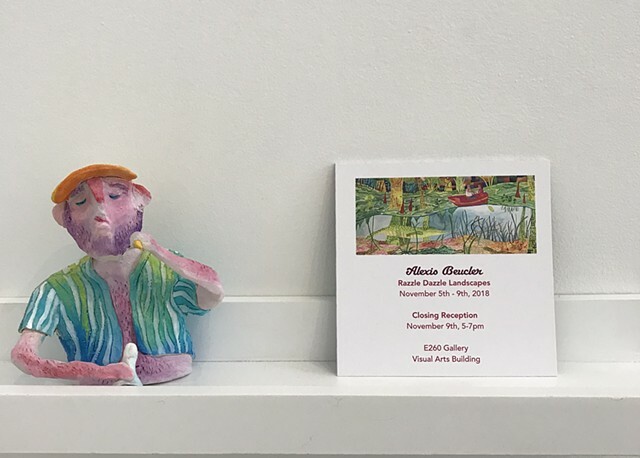 While the Annette Howell Turner Center for the Arts’ Spring Into Art is the premier exhibit to showcase local and regional artists, Valdosta State University Art’s Valdosta National has become the region’s premier showcase of art from across the nation. 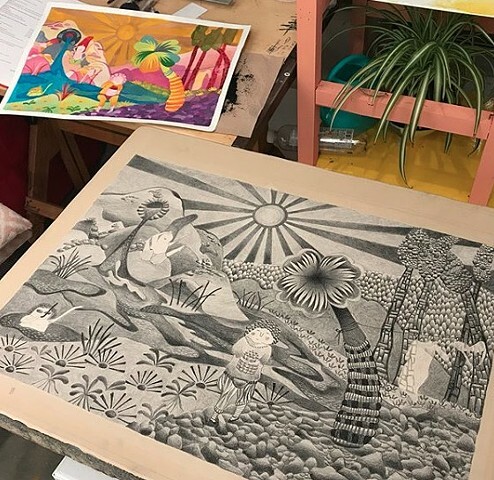 Granted, anyone nationwide can enter the open Spring Into Art, and anyone local can enter the juried Valdosta National, and occasionally these lines do cross, but the Valdosta National allows area art patrons the opportunity to see distant artists’ styles and themes. This is VSU’s 28th annual juried art show open to artists nationwide. 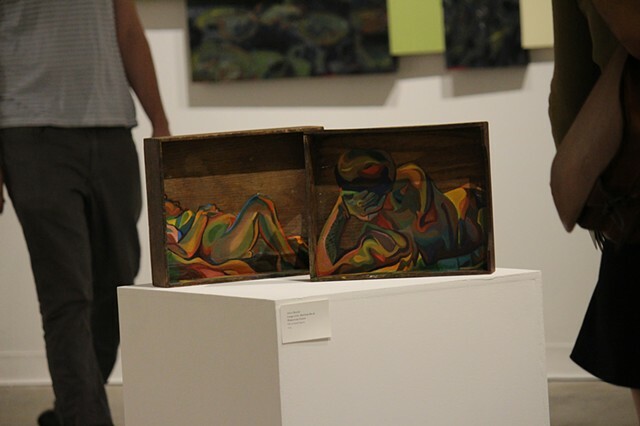 Julie Bowland, VSU Fine Arts Gallery director, said 338 works were submitted this year by 115 artists stretching from across the U.S. From the hundreds of entries, 47 artworks representing 42 artists from 28 states were selected for the show, she said. “The exhibition is an explosively colorful and diverse collection of visual expression which includes oil, acrylic, and mixed media painting, graphite and pastel drawing, mixed-media sculpture, printmaking, silver gelatin print, digital photography, collage and video,” Bowland said. Carrie Anne Baade is the person who made the choices. She has exhibited works throughout the nation and world. 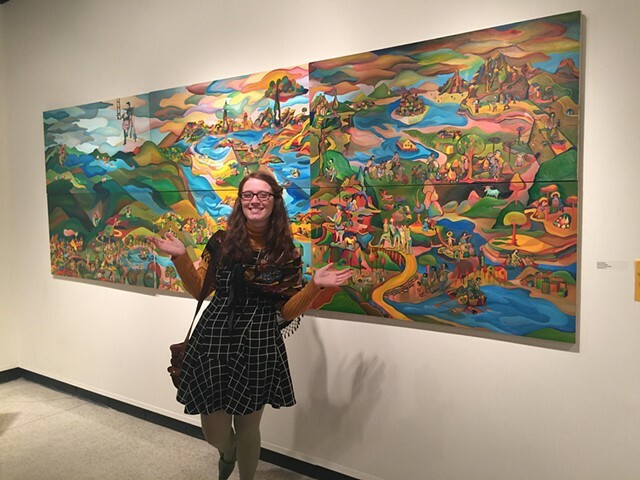 Her “oil paintings are rich with allegorical narratives,” according to bio information provided by Valdosta State University Art. 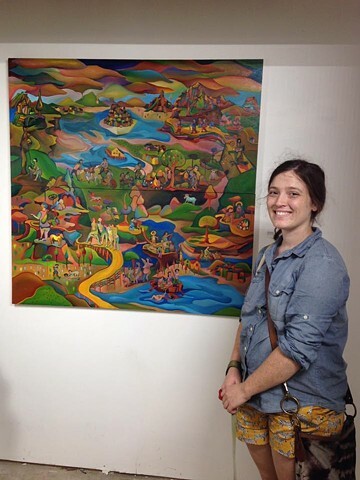 She is an associate professor of painting and drawing at Florida State University. 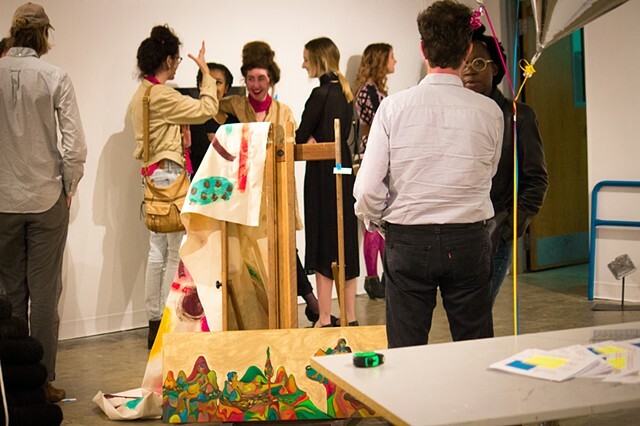 2 October 2015: Group Show: "Tall Tales & Cheap Tricks"
"Tall Tales & Cheap Tricks" was a narrative painting art show by BA/BFA Undergraduate Students of FSU taking place the 2nd of October in the Railroad Square Art Park 621 Annex Art Gallery. The show was curated by the illustrious and enigmatic Carrie Ann Baade. 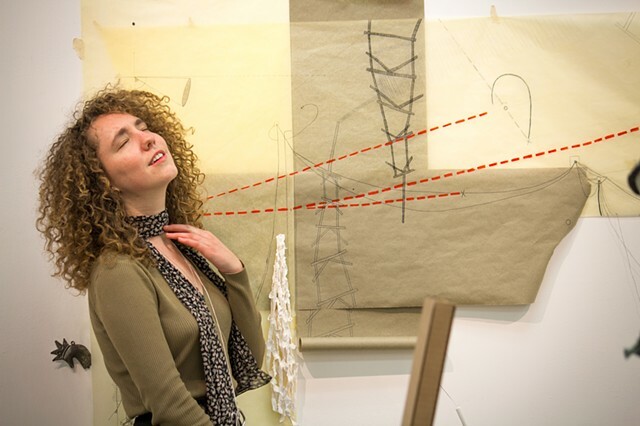 17-27 September 2015: Group Show: "Lasting Encounters: The Self"
"Lasting Encounters: The Self" was a FSU BFA & MFA art show in the Phyllis Straus Gallery curriated by Christopher Steven Watkins and Carlos E. Kempff on September 17-27th. The Oxford English Dictionary defines encounter as a meeting face to face—among other similar things. When one thinks about it, there is only one truly lasting encounter throughout one’s life, and it is with one self. The construction of the self and its identity is an arduous task that involves many individuals, situations, and history: other lasting encounters. This exhibition will highlight how, within their practice, visual artists deal with themes of identity and heritage in a globalized world, where race, gender, and sexuality have taken center stage in the discussion of cultural development. 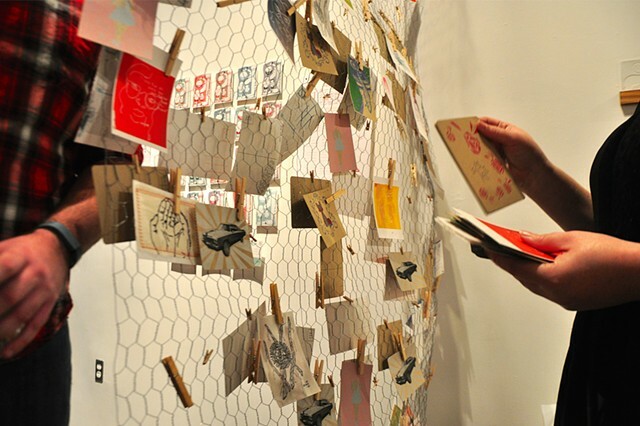 5 December 2014 Group Show: "Ephemeral Sculptures, Installation Art, Participatory Events, and 1000+ Handprinted Postcards"
This show was curated by Haley Lauw on 5 December 2014 in the 621 Annex gallery, Railroad Square, Tallahassee, FL. 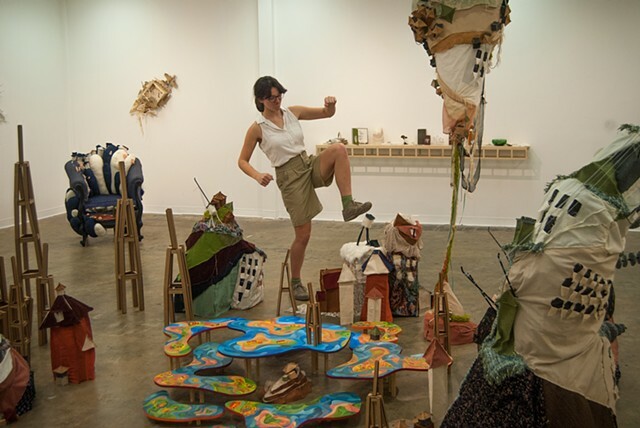 The show exhibited works from FSU BFA/BA Undergraduate Students. 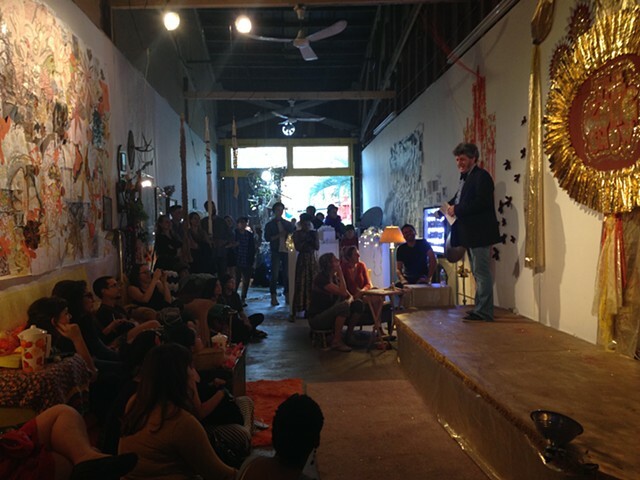 22 March 2014: "Static Feelings: An Installation and Performance"
This group show was curated by Kelly Boehmer and Chuck Carbia in the 621 Annex, Tallahassee FL. 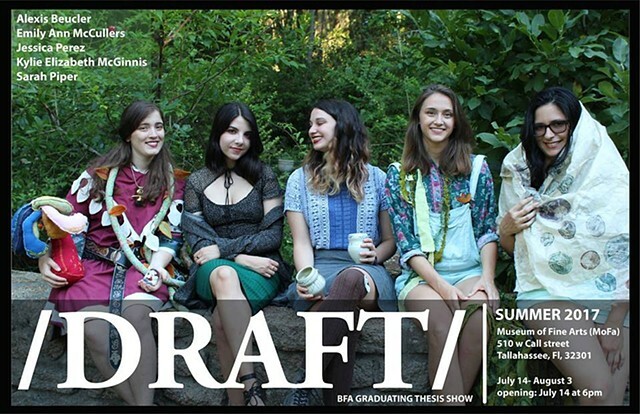 The show exhibited works from FSU BFA/BA Undergraduate Students.